Humans can interfere with the natural breeding processes of plants in order to create what are called hybrids. These hybrids are selected to bring together beneficial characteristics of the parent plants. There are a wide variety of advantages of hybridization. However, selective breeding has pros and cons, both of which should be addressed. What Is Hybridization of Plants? Plant hybridization refers to a process of interfering with the natural plant breeding process. It is generally the deliberate breeding of two different varieties within the same species of plant and is something called selective breeding. The male pollen is artificially transferred to the female pistil and a seed is formed. Selective breeding or plant hybridization is usually undertaken in order to combine positive characteristics of two different plant varieties. The merits of hybrid varieties of plants are therefore supposed to outweigh the merits of either plant "parent." Hybrid plants are usually more vigorous and faster growing than other plants. This can be great for those working in agriculture as they can reap greater crops and make more money. These plant types are also more resistant to many diseases and afflictions, which effect parent plants. Fungi, bacteria and viruses can otherwise wipe out whole crops. 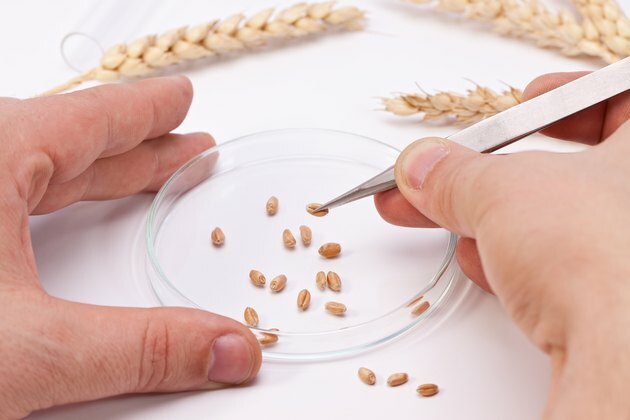 Disease is such a problem for plants that some selective breeding is done for the purpose of creating strains that are more disease-resistant. In a similar vein, hybrid plants can be less susceptible to problematic growing conditions. Plants can be bred to be more tolerant of little water or extremes of temperature. Many seeds sold for home gardens are selectively bred to make them easier to grow, essentially. For plants that are not being grown for food, selective breeding can be useful in creating uniformity. The plants will, therefore, be perceived as more attractive. Plants can even be selectively bred to produce more visually appealing characteristics, such as bigger or more brightly colored flowers. Selective breeding is also a much safer way of manipulating plants than through genetic modification, commonly known as GMO. It's more a process of speeding up evolution, rather than overriding it entirely. One of the main problems people have with selective breeding is that it can contribute to loss of variety. This gives little room for evolutionary expansion in plants further in the future. Some criticize selective breeding as it does not take into account genetic mutation. It can only maximize good traits, rather than removing bad. Therefore, in the future, the whole species of plant can end up with the same bad trait, which can lead to species wipe-out. A depression in gene diversity can actually cause genetic mutation, too.